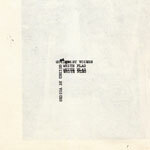 'White Flag' is one of three new singles from the upcoming Guided By Voices record 'The Bears For Lunch'. The third album of an extremely productive year, 'Bears' is yet another example of how high Guided By Voices are flying right now. Many bands struggle to release three albums in their career, never mind three in one year . The chugging, melancholic, melody-mad "White Flag" ("I think you know this time it's real," Bob sings over an almost New Order-ish bass line) is graced with 'Casino Model' and 'Zebra Film Negative' on the flip side. The other singles also being released at the same time are 'Hangover Child and 'Everywhere Is Miles From Everywhere'.